Some things happen in life that take us by surprise. They happen suddenly, taking place at times when we are caught off guard. But the gospel of Mark records for us in chapter 13 what Matthew recorded in chapter 24 of his gospel. Jesus and his disciples sat on the Mount of Olives one afternoon looking toward a crowded city of unsuspecting people when Jesus predicted the coming of a great and terrible day. That terrible day would arrive some 30 years later and became known as the abomination of desolation. The Lord spent the better part of Mark 13 outlining the details of the destruction that the Roman war lord Titus would wage against the holy city. The generation Christ spoke of that day on the Mount of Olives would be unaware that this destruction was fast approaching, and most did not listen to the Savior’s warnings. And many were surprised in horror as they were destroyed during the great destruction of Jerusalem. But in verse 32 of the chapter, Jesus speaks of another great day that will confound us all. Jude does not describe it as a great day but the great day! The scriptures teach that no man knows the day nor the hour, not even the angels in Heaven nor Christ himself knows when he will be commanded to return in the clouds to declare time no more and the judgment upon us. Only the Father in Heaven knows when that great day will come to pass. But we must all come to realize that Christ’s return will happen in a mere moment. Paul contended to the Thessalonians that the day of the Lord would come like a thief in the night. Peter used the very same words to describe that unsuspecting hour when the eastern sky would split open with a deafening sound and the clouds be rolled back like a tapestry revealing the Son of God and his angels. In other words, it will arrive at the most unsuspecting time. Maybe you’ll be driving down the road in your car, or working away at your job. Perhaps you’ll be sitting at the dinner table with your family, or even be asleep in your bed. No matter what is going on in your life when Jesus comes in the clouds, we shall all be surprised! So with that precedent set, Jesus tells a short parable in verses 34-37 of Mark 13, to further illustrate the idea that He would come again, but the time remains unknown to us. Jesus said, “Watch ye therefore: for ye know not when the master of the house cometh, at even, or at midnight, or at the cockcrowing, or in the morning: lest coming suddenly he find you sleeping.” Are you like me in that your heart races with surprise when you are awakened from sleep unexpectedly? I daresay there would be no greater surprise than to be awakened out of sleep one night because the judgment has arrived. But for many today, spiritual sleep is a constant exercise for them when it comes to the important things of life. They have no real concern for the importance of preparing to meet God. Oh sure, they look to be wide-awake in their physical body, but spiritually they have yet to wake up! But if there is one thing that we cannot afford to sleep on brethren, it’s the Lord’s return! There are a few Bible examples of people that used sleep to ignore the things that were right. And those who sleep spiritually are similar to these examples. There are some who sleep the sleep of Jonah, which was an unrealistic sleep because Jonah had refused to see reality. He decided he would ignore God by refusing a trip to Nineveh, and instead boarded a ship, where he went down into the hold of that ship and went to sleep. He thought that if he ignored God’s wishes, it would take him out of the circumstance he was in, but it did not. We act like Jonah sometimes and sleep on our responsibilities to God hoping he will forget about them, and let us off the hook. There are also those who sleep the sleep of the weary like Peter, James & John did in the Garden of Gethsemane on the night that Jesus was betrayed. They were worn out from the events that occurred during that final week of the Lord’s life, and could not hold up under the stress. So the scriptures teach that these men slept during the time that the Son of God needed them most. I see people today who are worn out from the never ending struggle with Satan and the weariness of always having to live right, and so they sleep on the challenges of Christianity. Then there are some who sleep the sleep of Samson, who dozed off on the knees of Delilah while she called for a Philistine man to shave off his hair, which relinquished his strength. Samson knew the dangers of the situation he was in, yet foolishly thought he could keep shaking himself from the bonds of sleep, until it was too late. I’d go as far to say that there are some here today who know the dangers of neglecting their responsibilities to God (such as seldom prayers, a lack of Bible study, never visiting the sick, or poor focus in the worship), yet they continue to sleep, while the time approaches when it will be too late to awake out of sleep! But then there are some who sleep the sleep of Eutychus, which is the sleep of the injured. This man fell out of a third story window while the apostle Paul was long preaching and presumed dead, but Paul revived the young man saying, “His life is still in him.” Some people have survived near fatal injuries. They’ve flirted with death a time or two in near death experiences only to come out alive once more, yet they continue to sleep on the gospel that they ought to obey! Then there are also those who sleep the sleep of spiritual death like some of the members at Corinth did. This is why Paul wrote in chapter 11 and verse 30: 30 For this cause many are weak and sickly among you, and many sleep. These people had improperly observed the communion of the Lord’s body, and this lead to their spiritual deaths. But others sleep the sleep of discouragement, like Elijah slept over in I Kings 19. In this instance, Elijah was feeling sorry for himself because the wicked queen Jezebel all but guaranteed that she would have him killed in a 24 hour period because he had slain all those false prophets at the brook of Kishon. But later in the chapter, the Father showed his power to Elijah by tearing down mountains and creating earthquakes and fires, proving his omnipotence over any adversary that stood in the prophet’s path. Elijah needed to get up and be about his business for the Lord of hosts, for he was more powerful than the adversaries of Elijah! Many are sleeping the sleep of discouragement or pity. They are mistreated and persecuted just like Paul warned that all Christians would be to Timothy, so they just go to sleep instead of facing the trials of life. But probably the most common sleep is the sleep of the sluggard. They put off salvation until tomorrow. They thought about obeying the gospel and would like to do what God teaches us to do, but they foolishly think that they can shake themselves from this sluggish state when the convenient season arrives and somehow become exactly what the Lord expects. This was certainly the case with Felix the governor when Paul defended himself against the accusation of heresy before the Roman council in Acts 24. Felix trembled at the thought of salvation from God passing him by, yet he allowed the spiritual sleep lingering in his eyes to put it off until a convenient season had arrived. We run across a lot of Felix-minded folks in our communities. Salvation sounds like a neat little deal to them, but they lack the sense of urgency needed to obey the gospel. They sleep on their separation from God by sin, waiting for a time that better suits them and their busy schedule. The fact is that this life comes with countless distractions that coerce us all into slumbering on the eternal necessities of life. But friends, life is far too short and eternity is much to certain for us to sleep on Jesus who gave his life to save us! So be honest with yourself…are you sleeping? What Does it Mean to Be a Slave to Christ? If a person were to promote slavery today, that person would be relegated to a class of social outcasts. I do not uphold segregation or advocate for 19th century American slavery. In fact, I do not advocate for any type of physical, human slavery for that matter, but I do vie for the slavery that James proudly proclaimed in his epistle. James 1:1 says, “James, a bondservant of God and of the Lord Jesus Christ.” The following discourse explains why Christians need to bring spiritual slavery back in style. The word “bondservant” in James 1:1 comes from the Greek word “doulos.” This word carries with it the connotation of a slave. Yes, James is saying he is a slave to the “Lord Jesus.” There is no question why James calls Jesus “Lord.” Lord means master. Although submitting to the status of a slave before the Master will inevitably alter a Christian’s physical life, the change in spiritual submission to the Master is the driving force. Only when the individual spiritually cries out, “Have mercy on me, O Lord, for I am weak; O Lord, heal me, for my bones are troubled,” (Ps. 6:2-3) can the Christian please the Master. Psalm 6:2-3 does not endorse a sinner’s prayer. Too many misled individuals have uttered such a meaningless prayer only to return to their self-serving life of sin as a dog returns to wallowing in his own vomit (Proverbs 26:11). No, such an ineffectual prayer will not suffice. Psalm 6:2-3, and many other Bible authors who speak of God as Lord of their life, embody the mindset and willingness to sell all and follow Christ and His orders no matter the cost. After all, a slave has no rights, owns no property, and deserves no wage. The slave is the life and property of the master. Being such, the Lord requires honesty, obedience, diligence, trustworthiness, loyalty, and self-denial. Unlike earthly masters, the Lord Jesus does not force submission. 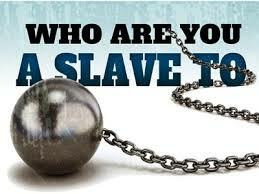 Yes, we owe a life of slavery to Christ because He purchased our lives with His own blood (Acts 20:28 & Hebrews 9:14-15). Christians are allowed by God to live anemic lives of selfishness and vanity. They are welcome to trample through His blood as they speak idly of His holy name or substitute complacency for promiscuity. Because God is loving, He will force no one to submit to Him. Nonetheless, because He is righteous and just, He cannot allow sin to go unpunished. On the day of judgment, Christ will not be your friend and companion. He will be the Judge. Is Christ the Lord of your life? If not, bring spiritual slavery to Christ back in style.